Welcome to my website, BobCorson.com. It is designed to illustrate and explain my collection of antique sterling silver items enameled in the plique-à-jour technique. My hope is to illuminate a very narrow niche in the chronicles of the decorative arts—the 2 decades bounding 1900. The amazing enameled work, made for only about 20 years, seems largely to have escaped professional notice. 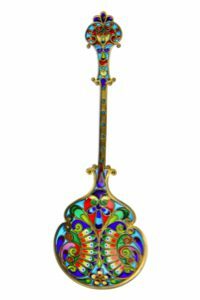 It was a time when jewelers, large and small, made and profitably sold plique-à-jour enameled spoons and other exotic items in a souvenir market. Enamelists today find this to be astonishing. Enamel is defined as glass fused to metal. Enameling is an ancient, time intensive art, and it is currently practiced in many forms. Cloisonné work is widely recognized, while champlevé and guilloché pieces are more rare. 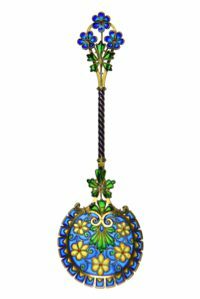 Plique-à-jour enamel is distinctive because it has no metal backing, so that when held to the light, it appears as a stained glass window. Plique is considered by enamelists to be the most difficult of all the techniques, and today is only found in jewelry and fine art. By the 1880s, the Industrial Revolution had created a new social and economic Middle Class. The Arts and Crafts Movement was working to revitalize fine craftsmanship as a counter for industrialized, shoddy merchandise. The art world had rejected Victorian busyness in favor of a new art—art nouveau. Plique-à-jour designs featuring flowers and leaves in swirling, flowing lines were quickly embraced in this new style. The swelling economy had provided disposable income for the newly rich folks, and they began to travel to see the world. And they were hungry for souvenirs from distant places to bring home to focus their memories and dazzle their neighbors. In the 1890s, four major European jewelers supplied a high fraction of the souvenir trade in plique items. Three of the four were Norwegian: David Andersen and J. Tostrup in Christiania (called Oslo after 1924), and Marius Hammer in Bergen. The fourth was Georg Adam Scheid in Vienna, Austria. They all had large shops, well established in the trade, and all exported their enamel work widely. In Russia, many of the Imperial Jewelers made plique objects, however, their trade seems not to have been focused on the tourists. 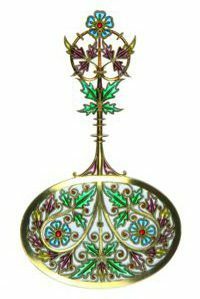 In the US, a few jewelers made a limited number of plique-à-jour spoons, and many imported them. A very few plique spoons were made by Gorham Corporation, Providence, R.I. and George W. Shiebler and Co., New York City. Occasionally, handmade plique demitasse spoons (demis) are found, the work of unknown US jewelers. Beyond souvenir spoons, a host of exotic plique ware enticed affluent travelers: sugar tongs, tea strainers, boxes, Viking boats in many forms and sizes, trays and tazzas, open salts, napkin rings, picture frames, cups and saucers, and more. These folks knew, as I have learned, that the fastest way to get rid of temptation—is to yield to it. Tourists on the Grand Tour of Europe kept the souvenir market thriving into the 20th century. However, the dogs of war were barking, and by 1914, WW I shut the market down. After the war, when tourists began again to thirst for souvenirs, the art world had moved on. Art Nouveau styles had been replaced by Art Deco; plique-à-jour enamel did not satisfy the new vogue. Plique workbenches in the big shops emptied. Thus, my collection of plique-à-jour enameled objects, made over 100 years ago in the brief span of about 20 years, is the fruit of a fleeting confluence of technology, sociology, economics, and the arts never to be repeated. When I first began to travel on business for my employer, I took every opportunity to explore the East Coast. I grew up in the San Joaquin Valley of California, and except for my Army Air Force duty in WW II, I never had the opportunity to visit the East Coast. So, just like the travelers of old, I brought home casual souvenirs, including airport souvenir spoons. These I quickly realized were poorly designed, cheaply made, and very overpriced. In 1962, I had a weekend between meetings in Philadelphia, and as a way to avoid the bars and pool halls, I found an entire street lined with antique shops. In those days, such shops were owned by dealers who often knew quite a bit about their inventory. In one shop, I found a cigar box full of old, tarnished, demitasse sterling souvenir spoons from both Europe and the US. The dealer said they dated to the 1890s. They were beautifully designed and crafted. And best of all, they were cheap. At a dollar apiece, I bought a handful. Later, as I studied my find, the craftsmanship I saw was such a contrast with the airport versions that I determined to search for more on my next trip. I quickly learned that the better spoons were decorated with enamel bowls and/or finials, and there were larger spoons too, of course at higher prices. In April 1969, I found my first plique-à-jour spoon at a antique store in Washington DC. It cost $20, and at that time the most I had paid for a spoon was $5. I now know that it was made by Johan G. Kjaerland in Bergen, Norway. It was just a demi with a plique finial, but its glowing colors, held to the light, set the hook. I was challenged to learn how it was made, by whom and where. Later, I began to wonder how it could have been sold as a souvenir—and at a profit. My collecting began to focus on plique-à-jour enamel. Slowly, I learned to recognize most of the makers by their styles and marks and thus where my spoons were made. This was pre-Internet time, and little was written on the subject. I have met a number of fine practicing enamelists from whom I have learned the basics of how plique-à-jour enamel is made. (Do know that I am not an enamelist myself.) Over these 50 years and more, the collection has slowly grown to over 425 plique spoons and a fairly complete sampling of all the premium plique items available to tourists of the time. To my knowledge, mine is a unique collection. It contains examples of all the plique-à-jour enameled silver made by all the major and minor jewelers of this 20+ year period. At the time these pieces were made, they may have represented a tiny fraction of one percent of all the souvenir items available. They were not made in large quantities; they were expensive and rare. Collections of souvenir spoons totaling several thousand were not uncommon then, yet a collection of this size might have had only 1 or 2 plique spoons, or none at all. Comprehensive plique collections seem not to have been made in the 1890s. Because plique work is fragile, many pieces surely have been lost in the 120 years since they first glowed in the light. Though I have seen duplicates of some of the pieces in the collection, many are likely sole survivors. Why are plique-à-jour enamels not found in museums today? It is likely that professional curators have never seen this work, first because it is seldom available, and then probably as a single piece, frequently damaged in some way. More importantly, because plique of the period was created for and sold to the tourist trade, a professional curator, never having seen the work and with the image of an airport spoon in mind, is unlikely to be motivated to pursue it. It is my hope that this website may help to overcome such a mindset. My collection is still growing, slowly and intermittently as opportunity occurs. eBay has largely destroyed the small antique shops I used to frequent, but it casts a wide net that has yielded some exquisite pieces. A number of folks have generously shared their experience and knowledge with me as my collection has grown. First were two practicing enamelists to whom I took my first major finds: Coral Shaffer and Barbara Skelly. They initiated me into the wonder of plique-à-jour—and its technical difficulty. Later, Diane Almeyda invited me to show selected pieces to her class of fledgling enamelists, and enjoy their wonder. It has been my good fortune to meet Patrick Taylor, a professional photographer and computer expert. Patrick has not only taken, but processed in post production all the images posted here. Further, my limited digital ability has frequently been recued from chaos by Patrick’s expertise. Finally, this website has come to be through the initiative and skill of friend and enamel enthusiast, Mary Waring. Thank you, Mary, for making it possible for me to share my collection with the World Wide Web.